Aiming to earlier diagnosis, improved accuracy of diagnosis and adequate treatment support, in our laboratory, we have researched advanced medical equipment. The topics being studied cover both of the fundamental research and clinical application. The former includes developing real-time and non-invasive sensing and imaging of biomedical information, which is relevant to tissue characteristics and function in addition to morphology. The latter includes applications of advanced ultrasound and optical imaging technology to diagnosis and minimally-invasive treatment support of diseases such as beast cancer, chronic hepatitis, myocardial infarction. Nowadays, non-invasive imaging equipment such as CT, MRI, US is indispensable to medical care. However, diagnostic information about tissue characteristics and function is insufficient compared with morphological information. Then, there is a real need for development of advanced medical imaging modalities for earlier diagnosis and more accurate differential diagnosis. In our laboratory, using ultrasound which has the advantage of being non-invasive, real-time, many biomedical imaging technologies such as 3-D blood flow vector imaging, myocardial contractility imaging have been investigated. 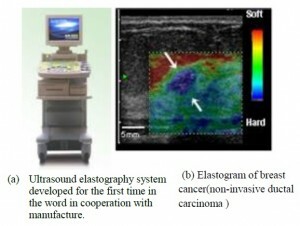 As for imaging of tissue characteristics, real-time tissue elasticity imaging has been developed in our laboratory and world’s first practical use of elasography for breast cancer diagnosis was achieved in collaboration with industries and university. In recent years, we started research on novel non-invasive imaging modality which combines ultrasound and optics, in the project ‘Innovative Techno-Hub for Integrated Medical Bio-imaging’ financed by JST and MEXT. Through these research works, we also aim to foster human resource to be active in wide fields from development of medical equipment to clinical practice. 1. T. Shiina, M. Yamakawa, M. Kudo, A. Tonomura, T. Mitake, “Mechanical Model Analysis for Quantitative Evaluation of Liver Fibrosis Based on Ultrasound Tissue Elasticity Imaging,” Jpn. J. Appl No.7, 2012.. Physics. 2012. 2. Bu S, Liu Z, Shiina, Kondo K, Yamakawa M, Fukutani K, Someda Y, and Asao Y., “ Model-Based Reconstruction IntegratedWith Fluence Compensation for Photoacoustic Tomography,” IEEE Trans. on Biomedical Engineering,　Vol. 59, No. 5, 2012.　pp.1354-1363. 3. Hirofumi Taki, Takuya Sakamoto, Makoto Yamakawa, Tsuyoshi Shiina, Kenichi Nagae and Toru Sato, “Ultrasound phantom using thin wires for the depiction of calcification: comparison of cross-sections of wire targets and mass targets,” IEEJ Trans. Electronics, Information and Systems Vol.131(No.9) pp.1528-1534, 2011. 4. Hirofumi Taki, Kousuke Taki, Takuya Sakamoto, Makoto Yamakawa, Tsuyoshi Shiina, Motoi Kudo and Toru Sato, “High Range Resolution Ultrasonographic Vascular Imaging Using Frequency Domain Interferometry with the Capon Method,” IEEE Trans. Med. 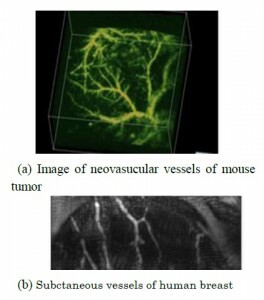 Imaging, Vol.31(No.2), pp.417-429. 2011. 5. H. Nakagawa, T. Shiina, M. Sekino, M. Kotani, S. Ueno: “Fusion and Molecular Aspects of Liposomal Nanocarriers Incorporated with Isoprenoids,” IEEE Trans. NanoBioscience, Vol. 6, pp. 219-222, 2007.